The two questions I get asked the most about DockATot are: Is the DockATot safe for my baby to sleep in? And how do I transition baby out of it to the crib? My professional opinion is that the DockATot can be used for awake time activities including tummy time, lounging, diaper changes and play. Activities that are supervised by an adult. The DockATot should not be used for sleep. Because all the factors that make it so snuggly and nest-like, also make it unsafe. 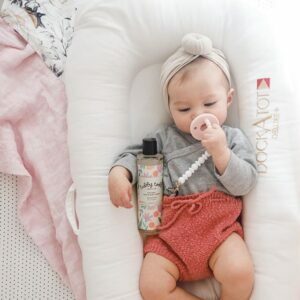 The soft, round sides of the DockaTot unfortunately put babies at risk of suffocation. This article will explain the safety risks of this popular baby product as well as guide you through transitioning out of it for sleep. Is DockATot safe for sleep? Many parents put their babies in the DockATot for sleep, especially during naps. They let baby sleep in it on the floor, on parents bed or they put the DockATot inside the crib. All of these are unsafe sleep practices. Both the American Academy of Pediatrics and National Health Service recommend that babies should only be placed to sleep on a firm, thin mattress inside a crib, cradle, bassinet or play yard. It’s interesting to know that only products clearly labeled “crib”, “cradle”, “bassinet” or “play yard” are regulated in the U.S. by the Consumer Product Safety Commission. All other products labeled “sleeper” “napper” “lounger” etc are not regulated. So, if you plan to move your baby to a co-sleeper or a crib, make sure it includes one of the above regulated terms. There are 2 steps to transitioning from the DockATot to the crib. The step you take will depend on your baby’s age and whether she’s started to roll. For young babies that aren’t yet rolling, I recommend you start with step 1. If your little one is already rolling, then skip to step 2. Transitioning to a co-sleeper bassinet is a great idea because it gives your baby her own safe, yet cosy, sleep space and allows you to sleep near her. At such a young age, she’ll need to be fed during the night which is easy if you’re next to her. Also, the AAP and NHS recommend sharing a room with your baby for at least the first 6 months (and preferably up to a year) as this decreases the risk of SIDS. RELATED: Your Baby Shouldn’t Sleep in a Rock n Play. Here’s Why & What to Do! RELATED: How are SIDS and Sleeping Position Related? Most young babies love feeling contained and cosy, so I recommend swaddling for sleep. Transitioning from the close quarters of the womb to a big open bed can be difficult for some babies. Their moro reflex (or “startle reflex”) which can wake them regularly is dampened by swaddling (You’ll find popular swaddle blankets below). I’ve swaddled hundreds of babies working as a NICU nurse, and I can attest to the fact that traditional swaddles come undone… a lot. (AKA a normal blanket that you fold & tuck.) So I highly recommend you use a swaddle blanket instead. A swaddled baby should never be placed to sleep on his stomach. Always place your baby to sleep on his back. Once baby starts to roll, he shouldn’t be swaddled or sleep in the co-sleeper bassinet due to safety reasons. Instead, it’s time to move to step 2. Now that your baby is rolling, swaddling and the low sides of her co-sleeper bassinet are risky. It’s time to transition to a crib. Make sure you put the crib mattress at the lowest level. Some parents prefer baby to sleep in a travel crib (like the Pack n Play playard) if they’re room sharing because it saves space. The other wonderful thing about a swaddle transition suit is that your baby can wear it long term! No need to transition out of it until your baby outgrows it. Of course, you don’t have to get any of the products I recommend, but I find that they do help baby sleep well through this transition. And a sleeping baby leads to a happy, rested mommy. Do you have questions about creating a safe sleep space for your baby? Ask me in the comments below or join my Facebook Live Q+A every Tuesday where I give out personalized sleep tips.